We all have that friend or relative who goes on about how smart their pets are, but are they smart enough to earn a degree? One university in the United Kingdom found that, with the right CV and a substantial payment, they probably could. Newsnight's producers wanted to see how easy it would be for someone to slip through the cracks at American University of London and receive, say, an MBA. 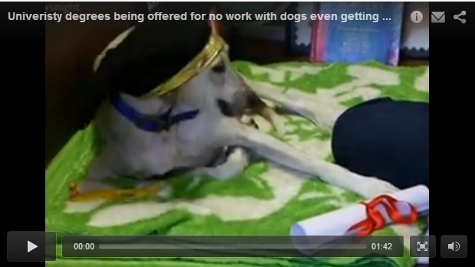 Armed with an impressive CV, Pete the dog almost did just that. According to the document, Pete was 36 years old with 15 years of experience working as a management consultant, and had earned a degree from a university in the U.K. With a £4,500 payment, Pete was mere weeks away from receiving the degree based on experience alone—no work required. Sure, this is an embarrassment to AUOL, which is now insisting it isn't a fraudulent university, but let's look at the bright side. Now all of those people with "smart" pets can put their money where their mouths are—literally.